Donate to Team Rubicon to help those in need of disaster relief services from Hurricane Michael. 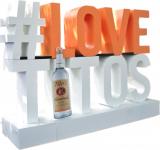 Tito's Handmade Vodka will match all donations, up to $25,000. Click Here to Donate to our Facebook Fundraiser!